Thursday at the Ness was a quieter, more measured sort of day, enveloped by sunshine and the persistent scrape of trowels on midden. 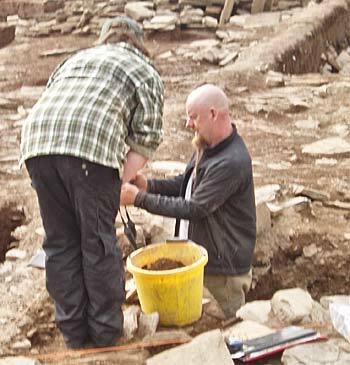 Additional interest was provided by Neil Oliver and his film crew, who interviewed Nick at length about the site. They discussed the familiar issues, such as the various theories over the decommissioning of the structures but, as his new programme is about the history of religion, they also touched on ideas of community in the past and particularly during the Neolithic. While Antonia was also interviewed about the monumental growing catalogue of art at the the Ness. 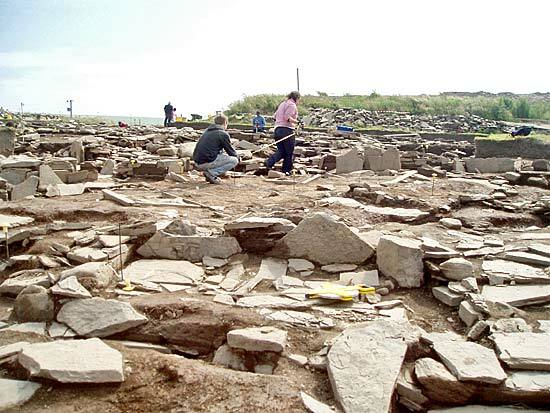 Neil’s work on Orkney will continue with visits to the Ring of Brodgar and the Stones of Stenness. He will also interview the head of archaeology at the University of the Highlands and Islands, our own Professor Jane Downes. It is fascinating stuff and you can all enjoy it when the programme is shown next year. 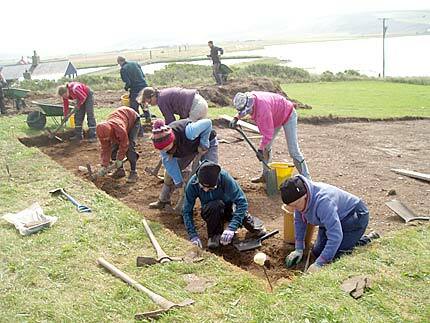 Nothing, however, stops the work of uncovering the site. Work starts in Trench T — manic-mattocking! The new trench on the other side of the house of Lochview has tantalised everyone since the turf was removed earlier in the week. Now the work of trowelling back the remaining topsoil and interface material has begun. Initially, there was a good deal more mattocking than trowelling and it is far too early yet to even guess at what is emerging. Some large stones can be seen, although initial impressions (invariably wrong) suggest that any potential wall lines are heading in quite the wrong direction for the suspected anomalies pinpointed by the geophysics underneath. Ben paid tribute to his largely inexperienced crew, pointing out that not only are they making good progress, but they are learning quickly and converting advice and teaching into good practice. We all live in hope, however, that eventually we will see evidence of a chambered tomb. Seb with his newly discovered polished stone axe in Structure Twelve. In Structure Twelve, a flint axe been discovered — at least we think it is flint. The edges appear to be flint cortex (the outer “skin” of the material) but the surfaces have flaked, suggesting that a quite different stone may be involved. Clearly, this is one for on-site geologist, Martha. 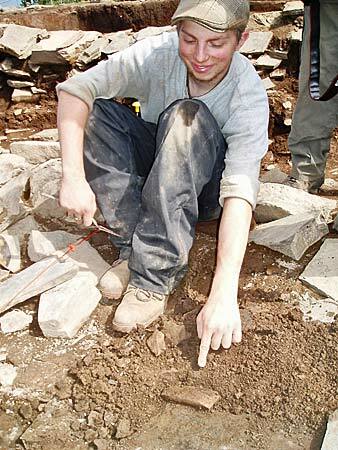 The axe was discovered towards the north end of Structure Twelve, where Seb is revealing a few potential stone roofing slates, which is radically different from his recovery of what can only be described as bulk pottery in previous years. In Structure Fourteen, Hugo has almost finished laying out his sampling grid for the floor and next door, just to the east of Structure Fourteen, work is continuing on the ephemeral remains of Structure Sixteen. This enigmatic structure may possibly date towards the end of the use of the site, but it is aligned in the same direction as Structure Fourteen, which could imply an earlier date. In Structure One, Dan, Andy and Mike have almost finished cleaning the floor deposits and will soon start a sampling strategy similar to Hugo’s. In Structure Ten, something unusual has been spotted. It is sort-of-oval in shape, whiteish in colour and is similar to the large whale’s tooth recovered, a couple of years ago, from Structure Eight. On closer investigation it turns out to be something which has never been seen before. Encased in coloured bandanas, possibly since childhood, Mike and his head have been a valued feature of the Ness for some years, but nobody has theorised on the colour or shape of what lay beneath the cloth. It is now beginning to turn a pleasing shade of light tan and visiting children no longer scream in alarm. Elsewhere in Structure Ten, Jan is beginning to dismantle the southern dresser. In a way it is sad to see it go, but it has fulfilled its purpose of shining a light on what took place in the structure. Just a couple of metres away work is continuing on the south-west robber cut in order to see whether the inner wall face replicates the rounded corners seen nearby. Scott and Fiona lay out the sampling grid in Structure Fourteen. Lastly, and by no means least, a warm welcome to Professor Scott Pike, of Willamette University, in Oregon, who has arrived for his now regular visit to conduct research and reveal the fascinations of the Ness to his latest crop of students.